Microsoft Azure provides two ways to provision Kubernetes, AKS and aks-engine. The latter is how Spotinst integrates Elastigroups and Low-Priority VMs into a native Azure Kubernetes cluster. Unlike the managed AKS service, aks-engine supports the latest versions of Kubernetes, azure native container networking, standard load balancers and persistent volume claims with scale sets. These features are necessary for the best possible experience with Kubernetes on Azure. Spotinst is able to analyze artifacts produced by aks-engine and provision an Elastigroup that manages Low-Priority and On-Demand VMs within that same cluster. All the benefits of Elastigroup, including fallback to on-demand and multiple VM types are now available to Kubernetes. 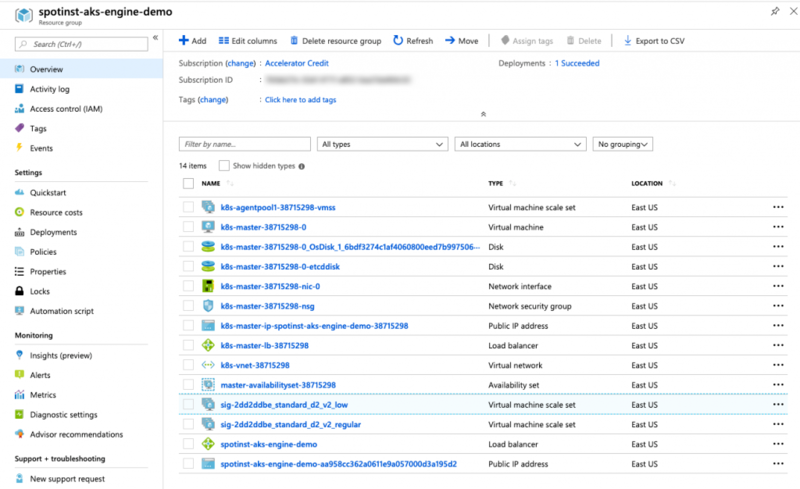 Following are two methods to get running with Kubernetes and Elastigroup on Azure. The first is a Quick Start that will provision and import configurations to Spotinst with a single command. The second explains how to run aks-engine followed by spotinst-aks-engine import with fine grained control of build options. Spotinst provides a docker image that packages all dependencies necessary to run aks-engine, create and integrate Elastigroup resources and launch the Spotinst Kubernetes Controller automatically. When the container is executed with the proper environment variables both aks-engine and spotinst-aks-engine import will create a fully provisioned Kubernetes cluster. WARN apimodel: missing masterProfile.dnsPrefix will use "spotinst-aks-engine-demo"
A new Azure resource group will contain the new Kubernetes cluster with a scale set managed by Spotinst. It is safe to scale the set created by aks-engine to zero. The full instructions for aks-engine can be found on GitHub. Minimally a cluster can be created with the api model that is used in the simple setup above. The deploy process of aks-engine will save all relevant cluster information to an output folder. This location is needed to integrate with Elastigroup. When complete a new resource group will contain the new Kubernetes cluster with a scale set managed by Spotinst. It is safe to scale the set created by aks-engine to zero. After following the directions for either the Quick Start or the import, the following resources will be present. The output directory will contain everything needed to manage the Kubernetes deployment, including SSH keys and the kubeconfig needed to connect to the cluster. When spotinst-aks-engine import completes an ID is returned. This ID is the group that manages the worker nodes for Kubernetes and can be viewed in the Spotinst Console.